This diagram suggests a plan to deal with our own human excrement in a way that totally recycles the stuff that Nature intended for us to put back into the LAND, not into the sewer systems and not out into our waterways! The main reason we are losing our topsoil today, with our city-oriented lifestyles, is that while we may well be eating healthy, mineral-rich foods, much of the mineral content from these good foods we eat ends up in our excrement, goes down the toilet, into the sewers and ultimately out into the oceans instead of back unto the land where it originally came from. Thus we are losing our topsoil with our city-oriented lifestyle, but this Garden of Eden plan solves this problem very well. While the plan pictured above and outlined below is a good one, it probably cannot be used for maybe 10 to 15 years (within the SAMPLE PARCEL B1 design) due to the lack of space to bury excrement, because most of the land is being used to grow one-season crops. COMPOSTING TOILETS and/or some other altenative system of burying well-aged excrement will have to be used for the first few years after the fruit trees are planted. Excrement must be aged long enough for the bacteria to thoroughly break down before it can be buried into the soil so the bacteria will not be absorbed by the crops or the trees there. The well-aged excrement could be worked into the soil in an area where a plant was recently harvested. The MANURE DROP-OFF container is shown as item #25 in lower-left side of PICTORIAL B1 as a dark brown box, and as a grey box in the same position in PICTORIAL B7, above. This container would be about 30 feet by 40 feet, or 1,200 square feet. This container can be used as a "staging area", if necessary, to place excrement that needs more time to completely break back down into rich, healthy soil. Perhaps it could be used in conjunction with composting toilets. There could be maybe eight compartments in the MANURE DROP-OFF bin, to allow for eight cycles of time to allow the manure to properly age.Then when it has aged there long enough, it can be buried into the soil. After the trees have grown up and the people rely more on them for food and have scaled back the one-season crops, the community may be ready to implement the excrement burial plan pictured above. The description from this point forward is a method of dealing with excrement that can be used only if it is done in a way that has been found to be safe. Most likely it will be for people who have lived on the land for awhile and have been eating only organic foods from the land there for quite awhile. In other words, their own bodily system is relatively clean. Comparing this PICTORIAL B7, above, to PICTORIAL B1 you can see that this is another representation of the same piece of land. The numbered trees in this PICTORIAL B7 represent a sample diagram for people to keep track of where to bury his or her excrement. The idea is to divide up the number of trees relatively evenly among all the residents and to assign each person a proportionate amount of trees, around which their individual excrement is systematically buried. In the top half of this pictorial above, we see a sample way for the trees to be divided up among the residents there. 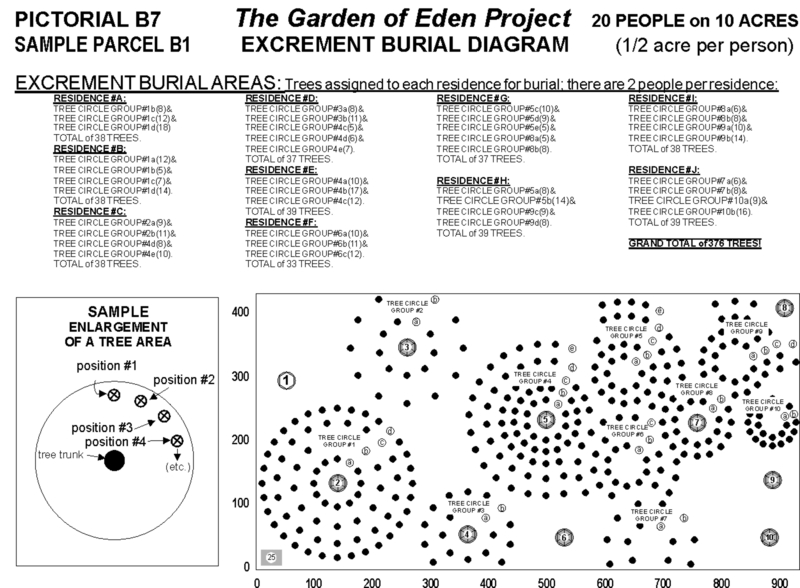 The excrement is buried in a circle around each tree, as shown in the lower left corner of PICTORIAL B7, in the very large circle with the words:"SAMPLE ENLARGEMENT OF TREE AREA" inside of it. The actual distance from the tree trunk to the burial spot would be about ½ of the planting distance between trees, as shown in the Fruit & Nut Trees: 15 YEAR YIELD ESTIMATES link. The average planting distance for all the trees would be 24 feet and ½ of that is 12 feet. According to this plan, a person buries their excrement at the first tree, (in their group of trees, as shown in their assigned trees in the top half of PICTORIAL B7), in "position #1". After burying their excrement, a bright-colored stake is placed next to this burial site, so no one steps in it. For the next excrement burial, a dull-colored, but visible, stake is placed in the previous excrement burial site at the first tree, while the bright-colored stake is moved to the second tree, for the current excrement burial, again in position #1. This process repeats itself for each of their trees, putting a total of about 25 dull-colored stakes, one at each tree. Then the cycle starts over again at the first tree, but this time around, for each of the trees, position #2 is used for excrement burial. This second cycle through the trees, the dull-colored stake in position #1 is moved to position #2, at each tree, as it is each tree's turn to be the excrement burial site. Therefore, there are still no more than a total of 25 dull-colored stakes (as in the case of "PERSON #1") for the 25 trees during the 2nd cycle through the trees (and for all the succeeding cycles through the trees. )The same procedure of moving the bright-colored stake to the most recent burial site (position #2, for this second cycle through all 25 trees), and putting a dull-colored stake at the previous tree's site is repeated through all 25 trees again.